I wanted to write this letter to say thank you for making me feel better. I first came to see you almost two years ago when I had been experiencing a chronic neck and upper back pain. After a month of seeing you, I felt better. In fact, I felt 100% better. Thus, I didn't come back. It has been almost two years and I just recently noticed some pain in my neck and upper back again. The theory of coming back monthly of quarterly to "maintain" good spinalstatus must hold true. Additionally, I was experiencing tennis elbow (tendonitis) for the first time in my life. My arm had been very sore since March 2006 when the tendonitis began. My arm was so sore; I couldn't brush my hair. When I started seeing you again, just a couple of weeks ago, you said with a combination of chiropractic care and your in-house acupuncturist, Dr. Xu Shi, you would be able to help heal my tennis elbow. Within the first one to two sessions of both chiropractic (adjusting my wrist and elbow) and acupuncture, I felt little to no pain for the first time in 6 months. Prior to coming to you, I had seen an orthopedic Doctor who said my recovery time would be 9 months to a year for the tendonitis and, if I couldn't stay off of it, I may have to consider receiving a cortisone shot to manage the pain. I am 40 years old this year and am convinced that chiropractic care and acupuncture are a better alternative than drugs and "managing pain". For me, it has been the difference in making me feel good and living a pain-free life and allow me to continue playing tennis, golf, and bowling. Before I came to you, I had severe headaches, jaw pain, and earaches for 8 months. My M.D. sent me to a specialist, who diagnosed my problem as T.M.J. I then went to my dentist, and got a guard to wear at night. The guard may have protected my teeth, but it didn't stop the pain and headaches. My dentist referred me to 2 therapists who I couldn't afford to see. Out of desperation, I called my insurance company who suggested I see a chiropractor. After seeing you, and getting treated for just a few weeks, my headaches have stopped, and so has my jaw pain. My hope is that there will be a way to get the word out to dentists, to refer patients to chiropractors, so that people like me with T.M.J. can get relief, without having to spend months figuring out what to do for it. Thank you so much for all your help. Meniere's Syndrome is chracterized with episodes of vertigo (feeling like the room is spinning), hearing loss, tinnitus (ringing in the ear), and pain in the neck and/or head. I was diagnosed with this in 1976. Medical doctors gave me Antivert, and antibiotics. The vertigo and ringing lasted about one year, then I developed about 70% hearing loss in both ears. I went to numberous doctors and non of them could help me. Finally, I went to Dr. Clarizio in 2004 for chiropractic care. After the first treatment, I was worse, and 24 hours later I got another vertigo attack. I went back to Dr. Clarizio two days later, and after another treatment, I was able to hear better. After two weeks of treatment, I could hear 90% in both ears. The combination of Dr. Clarizio's adjustments, and trigger point massage has kept my hearing to 90%, and I rarely have anymore vertigo, ringing, or pain. Dr. Clarizio has been a miracle worker for me. -Susan S.
I have been going to Dr. Clarizio since 1997. Since that time I have referred all of my friends and relatives and anyone else I can to this office. Why? Because I want everyone to know how good they will feel after Dr. Clarizio treats them. My sons routinely ask me to take them to the chiropractors. They know that the will feel better regardless of what ails them after being adjusted or treated by these doctors. It matters not what the ailment is. If we are treated in this office, we will feel better, period. Many years ago, I had a severe pain in my mid back. The medical doctors I saw believed I had a muscle spasm. The prescribed treatment was medication and rest. There was little pain as long as I remained medicated and I was unable to do much else if medicated. This lasted over a week. I finally decided to see the chiropractor. Upon examination, he noticed right away that I had a vertebra out of place. As soon as he adjusted me the pain I was feeling was almost completely gone. From that point forward I go to the chiropractor first before going any place else. I can tell you from my many years of experience with The Arcadia Spine Center that everyone should do the same. Dr. Clarizio and Staff are first-rate when it comes to helping you feel better. Everyone I have referred to them feels as I do. You can be treated anywhere but will not be in better care than that provided by these doctors and their wonderful staff. If you want to feel good, go to The Arcadia Spine Center! Ralph . As a Nurse for seventeen years I have dedicated myself to relieving discomfort whether physical or emotional in those left in my charge. As you well know, those of us in health care do what we do because of compassion not for $! My F.M.S was triggered when I tried to catch a patient who was falling. I have lived with my FMS for 11 years, it wasn't until I met Dr. Clarizio through my husband that I have finally found hope. Western medicine took my hope & left me in pain. Your office has shown me more compassion given me courage & most importantly hope I have hope that there are those out there who care about "the patient" as much as I have cared about mine. (Which is filled with moths!) not my insurance. I drive from Woodland hills because I trust you- I believe in you & can Never thank you enough for all of this. I am female, thirty-five, healthy, determined, and have been free of seizures for over seven years, thanks to Chiropractic Care. I was a very healthy and happy child and a, "Tom Boy." At fifteen years old, I was a sophomore in high school and played JV basketball. I also worked evenings at a restaurant, and was experiencing, "First Love." One night, I remember having a disturbing dream, and I awoke, to my body jerking all over. I new what was going on, but if I stood up, I would fall down. The seizure lasted about thirty minutes. I went to a few doctors. My EEG was way above threshold, and this was at it's highest point when would try to wake up. The doctor prescribed, Dialantin, and Tegretol. I became such a drugged out zombie, I had to go on home teaching for my junior year. My Father, who was a lab tech, had my blood level run. It was at toxic level. We tried to talk to the doctor about it, and he became defensive. So, I went to another Neurologist, who put me on Depakote. I never wanted to take the medicine, and I never found any answers. I decided at twenty years old that I would make a leap, and quit the anti-seizure pills. But, every few months a seizure would happen. I just tried to give myself plenty of time to wake up before I went to work. I was determined to not let it get in the way of life. I also truly believed inside, that if this was brought on later in life, it was something that could be stopped. At twenty-eight, I was a professional athlete, living and working in Hawaii. I had moved from the North Shore, to Honolulu. My job and lifestyle changed, so I joined a gym. When I walked into the gym, one evening, I saw a free Chiropractic screening. I went directly. Knowing I had issues. Dr. Kathrine Higgins, Team Chiropractic of Hawaii, offered a discount on x-rays and consultation. I accepted. My x-ray results were not too impressive from top to bottom. My neck, lumbar, and sacrum, were phase two and three. Arthritis is phase four. We began aggressive treatment, meaning three to four adjustments a week. I was required to do neck traction on a daily basis, starting off gradually. I was totally committed. There were weird twinges and sensations in spontaneous areas. I felt pockets of air move from under my arms, and down around my ribs. My lungs would open and I would breath with ease, and my digestive tract functioned better, less indigestion. I would sometimes have an emotional release after my adjustment, such as, involuntary heavy sobbing. Something profound didn't happen though. I wasn't having seizures or immune system challenges. In fact, I haven't had a seizure since. Dr. Higgins treated me. The next four years, I continued to educate myself on the nervous system, and receive maintenance. I would ask medical doctors how much they learned about the nervous system in medical school, and share the fact; "The nervous system is our master organ of our body." " It controls our thoughts, feelings, and actions." Physical, mental, and chemical stress, cause spinal subluxation. That means the spine is misaligned, pinching the nerves and cutting off communication. As a result, diseased, dead, decaying, and mutated cells are produced, and the body will malfunction and degenerate. That's not to mention pain, and immobility. I relocated from Hawaii back to Southern California in 2002. Currently, I am happy, and relieved, to be under chiropractic maintenance at, The Arcadia Spine Center. I'm still seizure free, and still learning. Occupation, finances, and lifestyle are stresses that will generally, be there. We can't stop living life. But, we can become more aware and educate others. Life is a series of experiences, and it's comforting to know there's more out there. When are bodies are healthy, our souls can shine and our bodies will heal. It's all connected. I have suffered from migraine headaches for about 2 years; this last year being the worst! The migraines became so frequent that I ended up off work for 4 months. During that time I was taking 2 types of medication daily; this in itself caused other health problems and still did not help the headaches. It was my last visit to the hospital for a Demerol shot that I decided out of sheer desperation to visit a chiropractor. I was so ill that day, but after examining my X-rays it was obvious that there was a problem (Subluxations everywhere! ) I started my adjustments immediately. Within 3 weeks I actually went a whole day without a headache. MIRACLE! Then it was 2 days without a headache ... and so on. I was finally able to return to work. I continue to get my adjustments, do my exercises, eat well, get my sleep, and go to the gym If it wasn't for my chiropractor. So I would be on permanent disability. Imagine that? I was first introduced to my chiropractor by wonderful parents. Prior to this holistic retreat, I was in a great deal of pain and headed toward "hunchback stardom". Since being a regular here, I now stand taller and have less and less pain. Although I do not always do my prescribed exercises, they are extremely beneficial to any healing process. I also notice, more often than not, that I constantly observe other people's poor posture - how funny! 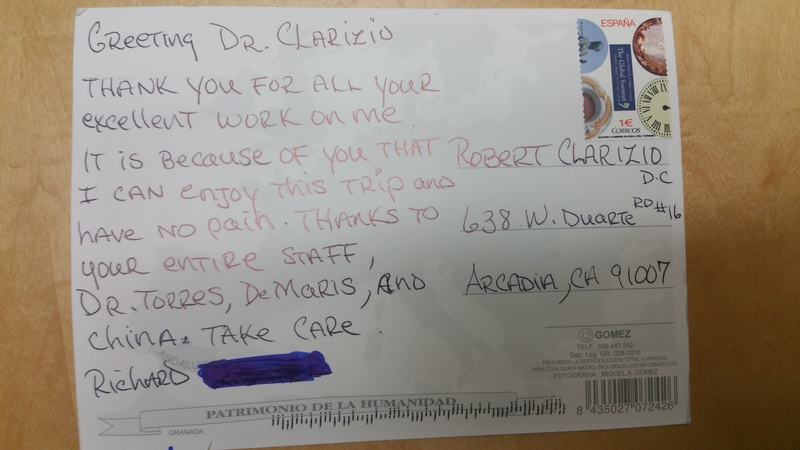 Provider Name: Clarizio, Dr. Robert D.
staff to any and all. * More Weight is given to a review when an evaluation has been completed. Description of Experience: I saw Dr. Clarizio for lower back pain. He x-rayed the area and diagnosed it as a disc problem. I returned for treatment. Member Comments: I messed up my lower back and it wasn't getting any better on its own. After about 10 or 11 treatments, Dr. Clarizio and his staff really put me back together again. My insurance didn't cover it, but it was worth the expense to feel good again. I'm now receiving physical therapy somewhere else through my insurance to prevent re-occurrence, but I plan to return to Dr. Clarizio for maintenance. The office staff are friendly and the therapists were very good.